I came across this photo today. 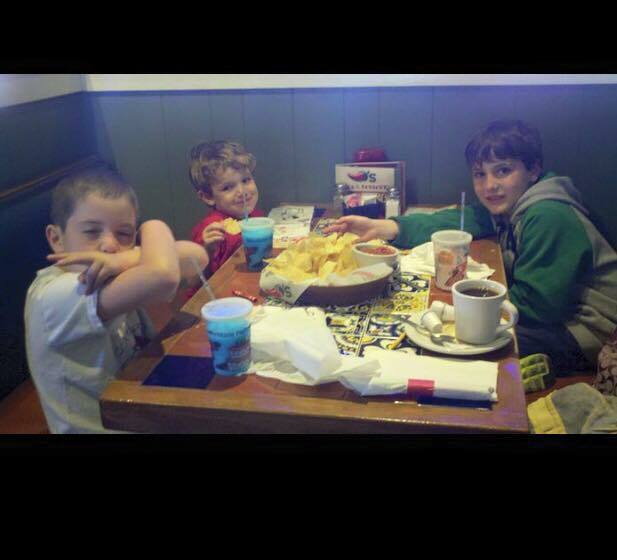 It’s a picture of my three little brothers that I took three years ago today. I had taken them out for a fun day of lunch and bowling. Do you see that cup of coffee to the right hand corner on the table? That was my lunch that day–my lunch and breakfast actually. I remember that day because I specifically remember every single Ed thought that I had that day. I even remember the jeans that I wore. (I remember because I chose them because they were my baggiest pair). It was a Sunday so that meant that I was going to my then-boyfriend’s mom’s house for dinner that night. How was I possibly going to go out to a lunch and to a dinner? I remember not knowing how it would be possible to do both. But I wasn’t going to give up my time with my brothers, either. So, this was my solution: coffee all day and that’s it. I remember us sitting at that lunch table and I remember all I could think about was the food. I had one tortilla chip and I broke it into several tiny pieces so it would last me as long as it could. I don’t remember any of the converastions I had with my brothers at that lunch and I don’t remember what we laughed about. But I remember what each of them ordered because I remember wishing I wanted a bite of it so badly. I remember every ounce of my time being consumed by Ed and that’s what made me so sad today when I saw this photo. It reminded me of the heavy and overwhelming thoughts I carried around with me for years when I was suffering from my eating disorder. It reminded me of the thousands of moments that Ed took from me. It reminded me of the kind of role model I was for my brothers at the time: the sister who didn’t eat. My heart has felt broken all day thinking back on that day and the many days I had like it with them and with others. But at the same time, this photo gave me a chance to appreciate where I am now. Recovery ebbs and flows, and lately, I haven’t been in the happiest place with what I look like, and while I know it will pass, I needed to be reminded today of how far I’ve come and why I choose to live in recovery. I would rather spend every single day for the rest of my life fighting to learn to love my new healthy self than spend another second back at that lunch table being a prisoner of Ed. I don’t want to go into the past two years of recovery and how I got here because I’ve told that story already through this blog over the past two years. That’s not what this post is about. This post is about remembering where we used to be and never forgetting it. I feel like sometimes it can be easy to forget where we used to be and focus so much on where we are now. Focusing on where we are is great because it shows we are present- but without remembering the pain of where we once were, we forget how special our recovery is. It’s also a reminder of the pain and suffering other people who are suffering from an eating disorder are going through right now at this exact moment. If you are one of them, please know that you are not alone in that pain. For me, this picture will always speak emotions of sadness. It will forever be the day that I was so stuck in my eating disorder that I don’t even remember what I talked about with my three little brothers. And it will forever serve as a reminder of how far I’ve come and where I never want to be again. But to put things in perspective, all five of my siblings were visiting me in Washington two weeks ago, and not only do I remember every single tiny thing each one of them ever said, but we all went out to dinner at a steak house to celebrate Hello Life’s second birthday. We all got steak, including me. And we all got dessert, definitely including me. And coffee was no where to be found. I know this post comes at a random time, but I had such a hello life moment this morning, I had to share it with you all. I was making my coffee this morning when I realized that my one tablespoon measuring spoon I use to measure my exact one table spoon of coffee creamer each morning was gone. If you guys remember, in my post about taking myself out for breakfast last month, I wrote about how I’ve transitioned coffee creamer back into my life since I started recovery two years ago. First, I started with sugar free coffee creamer and measured a tiny teaspoon of it. Then I moved to fat free creamer and used a tiny teaspoon to measure. Then I moved to one tablespoon of fat free creamer and for the past six months I worked my way up to using a tablespoon of real kind, full everything, creamer. On weekends, I used to let myself not measure it out because it was a weekend and I wanted that freedom. I knew I wanted to eventually stop measuring my coffee creamer, but I didn’t know when or how I would stop. So this morning, when my measuring spoon was magically gone, I just had this innate feeling this was the time. I thought to myself, ok Shira, you can just go buy a new one tablespoon measuring spoon tomorrow and just not have coffee today. Then I thought, or, you can just not measure it today, have it, and then buy a new measuring tool tomorrow. And then I thought, or, this is a sign that the time has come to ditch measuring your coffee creamer. So here, I am, about 10 minutes after finishing my coffee with creamer that I did not measure, and I feel so free and victorious that I had to share it with you all. I don’t feel guilty-I feel a little nervous, yes, but not guilty. Ed does not win today and forever more, in terms of coffee creamer, he’ll never win again. I’m not ashamed to say it took me two years to stop measuring my coffee creamer. And I’m not ashamed it took my measuring spoon miraculously disappearing out of my house to make me stop measuring it. I’m proud I never gave up my vision that I one day, wanted to break that food rule forever. And today I did that. On another note, all 5 of my brothers and sisters are on their way to Washington today from California to see my new home and have a late celebration for celebrating two years without a scale. It’s kind of crazy how things happen to work together in that way. My family is coming to celebrate Hello Life with me on the same day that my coffee creamer measuring spoon disappears. Now, when my little brothers have hot chocolate tomorrow morning and I have coffee, they won’t have to see me measuring anything in front of them. The thought of that alone almost makes me cry I’m so excited to show them that. Good bye one tablespoon measuring device thing that I will not repurchase and throw away if you ever do somehow show up again. I still remember the day I gave up my scale two years ago today. It was the most painful day of my life. I didn’t know how I would make it without waking up each morning and knowing what number I was that day. How would I know if I was good? How would I know if I was bad? How would I know anything if I didn’t have my number on the scale to tell me. Today, I know that I am no longer defined by a number. This is what I was defined by today: (a text message from my 11-year-old brother). “Happy Hello Life Day!You taught me what never giving up means. You taught me what it means to set a goal and not let anything stop you from getting it. You are the center of my heart,” he wrote. With that text message, I was reminded of why I started this journey-and that was to save myself from Ed so I can live in freedom and live knowing what it feels like to let someone else love me other than Ed. I started it because I knew somewhere deep down, I deserved to wake up and not have to run to my scale-that I deserved to start my day not being predicted by what that scale read. I started it so I could go to my family dinners. I started it so I could eat a piece of my own birthday cake. I started it because I knew I deserved to live. Today, as I celebrate my own recovery and the strength it took to get me here, I think about the many people who are still fighting for that recovery-for the people who are laying down tonight trying to make tomorrow that day of change. You are not alone. Even if tomorrow is not that day, you are not alone. When we suffer with an eating disorder, we often suffer in silence. Through this blog, we have gotten loud. And that noise, has saved my life, and the lives of others. To everyone who has stood by me these past two years-thank you is not enough. My recovery is not only mine-as I’ve always said, it’s the journey of this whole Hello Life community. Today is about gratitude-gratitude for all the support I have. Today is about compassion-compassion for those who are where I was two years ago. Today is about appreciation-appreciation for those who are in a stronger place in their recovery than I am. Today is about strength- strength to walk the path of self-love. Today is about celebration for life-and being ready to continue on this journey. I am alive and I am free. Happy second birthday Hello Life. My name is Shira. I’m 24. And I just took myself out to breakfast. Today was a huge day for our Hello Life community. It was the day we chose to take on our 2015 challenge/resolution of taking ourselves out to eat alone. While this resolution/challenge started out as just my own, many of our fighters took it on as well. We had people in the United Kingdom, New York, California, Oregon and Ohio take part in this challenge today with us. I have a lot to say about this experience and I want to share every part of it with you guys. I want to start by saying thank you to my dear friend and hero in New Jersey, (another fighter of ours), because if not for her support while I did this, I don’t think I would have done it. While she walked into her restaurant in New Jersey, I walked into mine here in Washington and we did this challenge step by step together. So let’s get down to business: most important question: where did I go to eat? 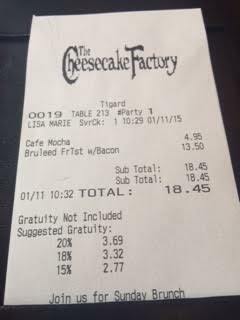 For those of you who followed this journey during its first year, you know that Cheesecake Factory is my favorite restaurant. I celebrated my birthday there, I celebrated my college graduation there, I celebrated leaving California for my new job in Washington there and I celebrated one year without a scale there. It’s where my most beloved Linda Fudge Cake lives. 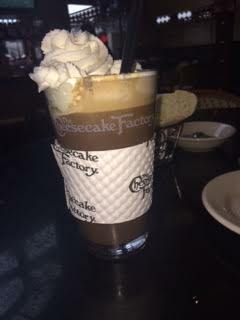 So, it’s not a shocker that I chose to go to Cheesecake Factory today. I knew I wanted breakfast. AT first I wanted to try something new . But I was already so nervous as it was and Ed was so loud this morning that I decided to go with a place I knew I loved already, a place I knew what to expect and a place I felt comfortable being in. Even before I left to the restaurant Ed was loud today. He was loud this whole week, but this morning he was louder than usual. First, he was telling me to do a body check. Then he was telling me to tell my boyfriend to take a picture of my “outfit” so I can see how it looked on me since he doesn’t have a full length mirror in his house. (I was wearing black pants and a black shirt, how bad can it look). It was just another way to do a body check. There was me, who was excited to take on this challenge, and then there was Ed, who was just daunting me with negativity. I did do the body check. I did ask my boyfriend if my outfit matched, but I did not ask for a photo. I did try to take a selfie of my outfit, but thankfully, you can’t take body photos too well as a selfie. It wasn’t the perfect start to this journey, but it happened. And I worked through it. 45 minutes later I was in the car driving to the restaurant. By this time, I have a fighter in Oregon who lives close, tell me she took on th e challenge herself this morning at Starbucks and got food and a coffee alone and I had our other fighter in New Jersey texting me as she was about to walk in to her restaurant too. I felt nervous, a little defeated by Ed, but not alone —and that is what got me through the hardest part of getting ready in the morning and walking into the Cheesecake Factory. I walked in and sat at a high top table by the bar. There were four seats and four menus. “Just me today,” I said and smiled. She took the other menus away and asked what I wanted to drink. I, along with our other fighter in New Jersey, decided even before sitting down, that Ed would not dictate what we ordered today. That’s it-just how I said it- a mocha. Not a mocha with non-fat milk. Not a mocha with splenda. Just a mocha. Wow. This mocha put my Starbucks skinny mocha to shame. Deep, deep , utter shame. There it is. It was so delicious. I eve ate some of the whipped cream with a spoon. Our other fighter in New Jersey got coffee and for the first time, added sugar and milk to it. When I was locked in my eating disorder, coffee creamer was a no. A total no. I still remember the first time I added it back into my life. It started as non-fat, then sugar-free, and now I have the real deal one. I still measure exactly one tablespoon of creamer into my coffee each day, and while I do not want that to be a new food rule for me forever, at this point in my recovery, I am happy with it. Sometimes on weekends I pour it without measuring-and each time I do, it’s another moment of freedom. To have this mocha today was truly a victory in itself. The minute I saw the menu I knew what I wanted. 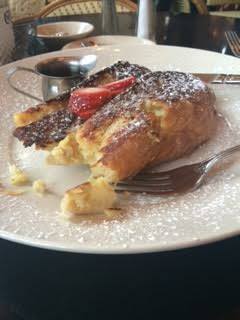 The brûlée french toast. I have no idea what brûlée means, and had I been on this date with myself even a year ago, I would have googled it to find out. When I was deep in my eating disorder, whenever I ate out, there were specific words on menus that I stayed away from: battered, sautéed, breaded…I can go on and on. I’m sure brûlée is on that list of Ed’s, but I didn’t care today. As I ordered the french toast and a side of bacon (extra crispy), I was texting our other fighter and we were encouraging each other. I kept thinking how crazy this is that we are doing this. A year ago today, I was counting down the last 10 days of being a year without a scale. I was just barley learning how to go eat out with others. I was learning how to not look at menus before going to a restaurant. It was a big deal and still is. To be sitting in a restaurant today, alone, and ordering what I truly wanted, is beyond my comprehension. I got my food and it was so beautiful looking. It was made just for me and I liked knowing that. I had a conversation yesterday with my boyfriend about how much I love to share my food and how much he doesn’t like to share his. “Well, mine is mine and yours is yours,” he said. It’s really a simple concept to him. Me, on the other hand, I don’t think I’ve ever gotten food in the past five years and have not offered to share it. Some of that is a mix of Ed wanting to give food away, and some of it is the caretaker in me who wants to make sure everyone is fed and happy. Today, I did not share my food. I texted a photo of it to our other fighter after my first bite. It was delicious. I was trying to think how it tasted and wanted to describe it to myself in the moment, but to be honest, it was just so good, I didn’t want to try to think about how it tasted- I just wanted to be in the moment. By this time, I was a little more comfortable being alone. Even though the waitress kept asking me if I was done, I realized she’s just doing her job—not an indication that I should have been done a long time ago. I usually eat really fast. This is something I’ve always done, but since entering recovery, it can sometimes be worse, especially when its foods I am not comfortable with or if I am in a bad place with Ed. It’s like eating the food fast makes it all go away faster. But today, I ate slow. I ate one bite at a time, chewed each bite and even put my fork and knife down as I chewed. I also used a knife today. Using a knife is a big deal. Using any kind of utensils for a lot of us in recovery is a big deal because it signifies we’re eating. When I was at my darkest place with my eating disorder, I only ate with my hands. Picking at bites or pieces here or there with my hands felt less scary than sitting and using a fork or spoon. Today, I used a knife to cut my food. Even now, I sometimes just use a fork. But today I did it right. That part of the meal-the mindfulness part-felt amazing. I felt like a “normal” person who eats out. Not like a puppet being controlled by Ed. I was just exactly full and I decided to have two extra bites of the french toast. It was worth the extra ounces of extra fullness. I took a photo and starred at it for a few minutes. I almost still can’t believe this is MY receipt. Two years ago , that receipt would have said “egg whites and tea” and definitely would have had another person’s order on it. It took me a few minutes to realize that yes, this is my recepit. This is my new reality. And there’s no one else’s meal on there but mine. I could not come up with one word. I was in so much awe of myself and the other fighters who took this on, I really just didn’t have a word. When I paid and was getting ready to leave the restaurant, I felt like crying. It was like this moment with me and myself and no one around me knew, but I knew. I just conquered something that even three months ago, I was not ready to do. Yes, Ed was there. Even before I left the restaurant, he had me do a quick check of how I looked in the bathroom full-length mirror. To say he was totally gone wouldn’t be real. And this blog, this journey, this story-this is real. But I didn’t care about Ed by then. I was and am so proud that I did this. I ordered what I wanted. I stopped eating when I was full. I enjoyed every bite. And most importantly, there was no guilt attached to it. I knew at that table, that I deserved to treat myself to ordering what I wanted and enjoying it. I walked out of that restaurant and felt like I was acting out a scene in the last part of a movie. If there was wind machine somewhere it would have been turned on and blowing my hair out of my face as I walked through those doors to the parking lot. I felt 10 feet tall. Of course I didn’t do that, because someone would think I’m crazy, but I am going to do it now on this blog. Wow. Even typing that out right now felt like a different person. I know today will not be the last time I take myself out to eat. I don’t want it to be. The fact that I didn’t let Ed stop me today, and didn’t let him be more powerful than me and the fact that I enjoyed this meal, makes me want to do it again one day. But, most importantly, today didn’t just mean that I conquered this huge challenge for me -it was a reminder of the support and love this blog has brought into my life and into the lives of others. I did not do this alone today. Other fighters did not do this alone today either. The fact that we, who used to feel and sometimes still do feel so alone in our battle to fighting our eating disorders, were not alone in this, is beautiful. It’s power. It’s recovery. When we suffer from an eating disorder, we suffer in silence. We were so loud. We texted. We facbeooked. We emailed. We told Ed he’s not part of this. We were loud, fighters. And we were heard. When we suffer from eating disorders, we often suffer alone. Today is also the 25th birthday of a special fighter in London. She started her journey to recovery after finding this blog a little over a year ago now. She’s not only become a huge inspiration and support to the people in the online support group, but she’s become one of my closest friends. She told me this past Christmas that if not for this blog, she would not be alive today. And now, she is celebrating her 25th birthday. This blog post and my meal this morning is dedicated to her and to our incredible fighter in New Jersey, who did this challenge with me today. There are so many things to say hello to right now. Hello to taking myself out to breakfast. Hello to ordering a mocha, just as is. 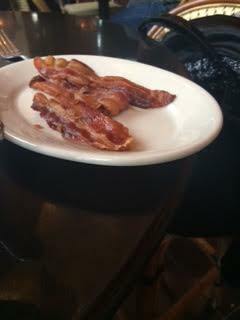 Hello to bruled french toast and crispy bacon. And hello to not knowing what bruleed means. Hello to birthdays that would otherwise not be celebrated if not for our recovery. Hello to conquering our greatest Ed fears. Hello to Hello Life’s two year anniversary of being scale free coming up in 10 days. It all started last Sunday when I wanted Thai food and I had no one to go with me. I didn’t want to get take out and have it cold when I got home. I saw a Thai food restaurant and was thinking that I should just go inside by myself, sit down at a table and take myself out to dinner. Um…just take myself out to dinner? alone? It’s something I have not done before. I’ve cooked for myself before, but I’ve never gone and sat down into a restaurant alone and ate. Never, ever. A lot in part because I know Ed would take a seat right next to me and learning how to entertain him as a dinner guest is something that needs to be planned and well prepared. Taking yourself out to eat alone at a restaurant is the most mindful act possible. It’s being mindful that you are taking yourself out to eat, and being OK with that and it’s the act of being mindful of what you are eating and how it tastes. There’s no one there to talk with you as your eating to be a distraction and theres’ no TV in front of your face either. And for someone in recovery for an eating disorder, it’s a lot to take on because that mindfulness will battle Ed in our mind the moment we even drive in the car to the restaurant. So I decided last Sunday that I wasn’t ready that night to go do it, but I knew that I wanted to make sure I would do it soon, so I made it my new year resolution. I wanted to give myself the time to prepare to take on this challenge. Even if it means letting Ed come along with me, I actually would rather do that and show him I can do it in front of his face. Sure, he will tell me that everyone there is looking at me wondering why I am ordering all this food for just me. Yup, he will definitely say that. He already did say it and I didn’t even go yet. And he will tell me it was enough to just take a few bits and leave. But that’s ok with me because I’m stronger than him now. I don’t want to do this challenge only as an act of eating; but as an act of self-love. I so deserve to be able to take myself out to eat, even in the face of Ed. I deserve to do able to sit in peace or discomfort, whichever it brings me, and walk myself through it and eat what my body is craving. For 2015, I am going to take myself out to eat a restaruant, alone. I am going to think about the kind of food I want that night and pick a place carefully. I want to put as much thought into it as I would if I was taking my boyfriend out on a fancy date because instead, I will be my own date and that deserves major planning. I was talking to the fighters in the support group about this and a few of them also wanted to take on the challenge. So another fighter in New York and I have decided to do the challenge together on the same day. This way, while we will each be taking ourselves out to eat alone, we will really not be alone because we will be doing this together. We will be going through the feelings of anxiety together and the discomfort together, and most importantly, we will be feeling victorious together once we are done. If there is anyone else reading this who would like to join us, we have chosen Sunday, Jan.11 as our day. I don’t think we will put a time on it because what if I want dinner and our other fighter wants breakfast? I like the idea of leaving that open so we have the freedom to customize it how we want to. Anyone else who wants to join, just please contact me through the contact me tab and let me know and I will make sure we all have the support we need as we take this on together. As far as the rest of 2015 goes, I only know this: I will continue to live life loving others without judgement and I will continue to remind myself that that love is deserved for myself too. I also hope this is the year Hello Life can become a nonprofit and start reaching others so other fighters can have the support and love they need. 20 days after 2013 I started this blog and gave up my scale. Never in all my dreams would I have thought it would have led me to almost two years of being scale free and in recovery from my eating disorder. Never would I have thought that it would bring so many beautiful souls into my life. This Jan. 21 will mark two years without a scale and in recovery. I cannot wait to celebrate with you all and I cannot wait to tell you how my dining experience alone will go. I know that everyone reading this blog has felt the same pain, anger, darkness and imprisonment from Ed this last year that I did. To our 15-year-old fighter in New York who just left inpatient treatment and is on his way back to school and freedom, hello life. To our fighter in Canada who ripped up her sick clothes, hello life. To our fighter in London who literally saved her own life by sticking to her recovery and using all the support around her and who is blossoming in every way, hello life. To our fighter in Kansas who continues to love others even though her heart has been hurting this year, who put real cheese on her veggies and who might possibly give up her own scale this year, hello life. To our fighter in New Jersey who continues to love her family and has been scale free for 9 months, hello life. To our fighter in Pennsylvania who has has continued to live with an open heart and push for recovery while being a mother and a wife day in and day out, hello life. To our fighter in the United Kingdom who celebrated her 21st birthday this year, hello life. To our fighter in France who ate a lemon pie, her favorite dessert, on her own, hello life. To our fighter in Oregon who just had a healthy baby girl,hello life. To our fighter in Canada who just made an entire vegan meal tonight and who continues to love herself, care for herself and live in the world of recovery even though life has not been the easiest on you lately, hello life. To the 600 people wearing Hello Life bracelets around the world, hello life. To our 13-year-old fighter in Tennessee who enjoyed ice cream with her friend this summer, hello life. To the many fighters who have told me this blog saved their lives…little did you know your support and love has saved mine. May we continue to fight together for our right to love ourselves and live in freedom not just in 2015, but for as long as it takes. Before I start this special Thanksgiving post, I want to just say thank you, thank you, thank you to everyone’s support, love and encouragement towards each other and me over the past 22 months that this journey has started. Every single day I am so filled with gratitude and appreciation for the beautiful souls this blog has brought together. To see our Hello Life community connect with each other, support each other and love each other through this blog, social media or personal relationships, even without meeting each other, truly shows how many wonderful people our world has when we open ourselves to it. With that being said, I wanted to take some time to write a special Thanksgiving post for all of us fighters around the world. The holiday season is one of the most triggering times for those of us in recovery, fighting for recovery, or who are in the depths of our eating disorders. We are surrounded by food, family and people and the pressure to try to enjoy meals while being present and not captivated by Ed. It can be one of the hardest things we face all year. I am writing this post today for a few reasons. First, is to remind us, and me, that we are human–meaning, that as we go into this holiday season and into Thanksgiving this week (for those living in the U.S.), there might be times we are not present. There might be moments or minutes we let Ed come in and take over. It doesn’t mean we are failures. It doesn’t mean we are weak. It doesn’t mean we can’t do recovery and the holidays at the same time. It means that we are practicing being human. When you are living with an eating disorder, there is no such things as human. There is only perfection. Learning how to be human again and be OK with it takes time and effort. We are practicing how to be present. It is my wish for all of us, including myself, to let go of our expectations of how “normal” we want to be during these holiday weeks and just let ourselves glide our way through, meal by meal, moment by moment. For me, the holiday times are still difficult. Being in Washington away from family has made it easy for me to adjust to my regular routines and regular food patterns. I will be flying home to L.A. for Thanksgiving and my patterns will have to break. Even with almost two years of recovery on my side, it doesn’t make breaking patterns easier. Even with the comfort of my family, it doesn’t make Ed completely silent. I sat here for days telling myself over and over that I will just go home and forget all my worries, forget Ed and just enjoy my Thanksgiving like a “normal” person. I told myself I would eat extra healthy during the beginning of the week so when Thursday came for Thanksgiving I wouldn’t feel as bad. But the more I kept telling myself that, the less authentic I felt. Who was that talking ? Was it me or was it Ed? It took me some time to sit and figure it out, but I’ve realized that was Ed talking. Not Shira. Because Shira would say why should I convince myself of anything? Why should I plan rigid rules all week instead of just be in the moment? That’s not the way I started my recovery and it’s not the way I live my daily recover either. I’ve always had the mentality that I will let myself feel discomfort, live in the gray areas and ride out the good and bad. I spent the first 7 months of recovery learning the beauty of living in the gray areas and not setting specific rules and being so black and white. To set rules as to how “normal” I want my Thanksgiving to be or how healthy I will eat before it would be going back to that black and white mentality and it’s not something I want to go back to. Instead, I’ve decided that I am going to spend today, tomorrow, and Thursday with only mentality: go with the flow. If I overeat, so be it. If I don’t, so be it. If I eat dessert three times, so be it. If I don’t, so be it. I am not saying it will be easy and I am not saying Ed won’t be there. But I am saying, that no matter what and no matter how many moments I may creep away from the present moment to consult with Ed during these holiday times-I will find my way back to the present. I will appreciate the moments, minutes and hours I spend in the moment. I will love myself for letting myself enjoy those moments and I will forgive myself for the times I don’t. This Thanksgiving, that is what I am most thankful for: the ability to forgive myself. Learning how to forgive myself is something that I’ve worked on for a long time, and it’s not in any way where I want to be yet-but I am far better at it now than I ever was. Learning how to forgive myself-wether it be for mistakes at work, slips in recovery, listening to Ed–whatever it is-has helped me love myself in a way that I never have been able to before. It’s helped me love others in a way I haven’t been able to before. Secondly,and not to be cliche, but I am thankful for the undescribale amount of support and love from my family, friends, and Hello Life fighters. I can say, without question, without the support of our fighters, my recovery would not be anywhere near where it is today. From the bottom of my heart–to all our fighters, especially those in our support group, thank you for your warmth, love, kindness, understanding and friendship–it’s what makes Hello Life, Hello Life and its what keeps me strong in my recovery. This Thanksgiving, Hello Life is adopting a stretchy pants/leggings/sweats policy the day of Thanksgiving and the day after (since we all know Thanksgiving never ends until all left overs are gone). This is to help lessen the impact of triggering clothes and to allow ourselves the right to feel comfortable on this special day with our loved ones. It’s also to practice self-love. I ask you to join the many of us who have already committed to the policy. And if not, I ask you to join us in showing yourself at least one act of self-love this week. If it’s not wearing comfy clothes, maybe it’s telling yourself something you love about yourself. If it’s not that, maybe it’s letting yourself spend time with someone you love. Whatever act of self-love you choose, know that you’re deserving of it, as we all are. It takes bravery and courage to walk the path to self-love every single day–not many of us can truly do it authentically and whole heartedly. That bravery and courage nearly doubles during the holiday time when Ed and other forces can be so overwhelming-yet here we are fighters, continuing to walk with that same bravery and courage. To all of us who continue to rise to that level of bravery and courage and to all of us who will rocking our stretchy pants, hello life. I have been meaning to update you guys for about two months now and kept finding excuses not to. Sometimes, when I was having a hard day I would say “ok, today is the day. I want to remind people that even once we are a while into our recovery we still have hard days.” Then I would think, no, I’m not ready to admit that at the moment-not even to myself and not to the world. Then there would be great days that I would want to share, and then thought that it wouldn’t be totally accurate of the hard times I’ve been having lately. And when I mean hard times, I don’t mean with eating. I mean with accepting my new body and talking positive to myself. And then today happened and I broke down and cried in my car at work and I knew the time has come to share a little bit about what’s been going on with me lately. I knew today was coming since I got hired for my job in March. “In October we do health screenings where they weigh you so you can get a discount on your insurance if you have a healthy weight,” my editor told me months ago. I even remember talking to E about it and what I would do when that time came. We decided to cross that bridge when it came. I’ve had to tell doctors multiple times now to please not tell me my weight and that I won’t look at the scale. It’s become easier and easier over time, but it is never without struggle and second thought that I say it. But when that happens, they write down the number, and we carry on. That’s not how it went today. Today, with my heart beating, I told the woman doing the screening to please not say the number and that I won’t look at the scale. And I decided to only do this because it is saving me about $700 a year on my insurance. Otherwise, I would never have even put myself through it. So there I was, yet again standing on a scale. It was absolutly horrible. Even hearing the words “ok, now stand on the scale,” made me feel like I was stuck in a trance I just wanted to escape from. I felt so judged. This one big number was all they cared about. The lady doing it said she had to write my weight down on a paper for me for my records. While she didn’t tell me my weight , she told me my BMI number (a number between 19-29 that supposedly indicates where your weight is on a spectrum from overweight, healthy weight or over weight). During my darkest times of my eating disorder, I would plug in numbers on an online BMI calculator to see how little I had to weigh to make the underweight category. I took the paper that had my weight written on it and folded it in half right away, walked out of the room and ripped it apart and threw it away as fast as I could. It sounds so easy, but it was so hard. I just wanted to cry, which ended up happening a few times already. My weight was in my hands. Literally, in my hands. I felt like my entire recovery rested within this piece of paper. Do I look? Am I ready to look? Maybe I am ready, I told myself over and over. “No Shira, you are not ready. You are not ready!” I was screaming to myself in my own mind. I had to tell myself that at least 30 times. And you know how I know I was not ready to see this number? Because lately, more than ever in the past six months, I have been doing a lot of the negative Ed actions that I vowed to stop doing : taking pictures of myself in the mirror, telling myself mean things, being hard on myself. But at the end of the day, this is the human side of me. And for every picture I take, I delete it right away. And for every negative comment, I later tell myself I love me anyway. But, being that I haven’t been in a good place with myself recently and being not even two years in recovery yet, I very much knew I wasn’t ready to see that number. Maybe one day I will be-for now, I am not. But to have it in my hands was an unreal feeling. In all my recovery I have not been so close to knowing my weight. If I wanted to, all I had to do was open the paper. Even to know that BMI is very triggering for me. If I wanted, I could sit here on my computer all night plugging in different weights on a BMI calculator to see what weight gave me that BMI, but I won’t do that. I won’t do that because I deserve better than that for myself after all the work I did ripping apart that paper and throwing it away. But I am still so sad. Sad, but proud. Part of me is sad because I let Ed tell me that if I did see that number, I would be so upset with myself for letting myself get this “big,”-and more sadly, I believed him. I still do believe him. The other part of me is sad because, to be honest, a part of me misses knowing. I miss knowing that number. I miss knowing that kind of measurement in my life. For years, it was all I knew on how to measure my success. And the biggest part of me is sad because seeing the power that little piece of paper with my weight on it had over me reminded me that Ed is still a big part of my life. And for whatever reason, that keeps making me cry, even right now as I write this. It pains me to know that my eating disorder still, even to this day, can make me cry-to know, that if I did for whatever reason see that number, I would not be ok. I wish I could say I would see that number and be ok with it. I wish I could say I could know that number and not let it ruin everything I worked so hard for. But that’s not the truth. The truth is, life after the initial first phases of recovery is so emotionally tasking. It takes a lot of work. Every day I work at being kind and compassionate to myself- every. single. day. Every day I work to tell myself I love myself even if I hate what I am seeing in the mirror. Today, though, I was reminded of the dark space Ed still holds within me. It’s no where near the space he used to take up and it’s no where near as deep, but it’s still there. I can still hear him now telling me that I should have just looked at that paper and seen the damage. I probably will wonder for the rest of the night what that paper said. I will have to refer back to this post multiple times to keep me from searching for a weight that fits that BMI calculation. I’ve been wanting to write this post for a while–about how life, even after almost two years into recovery, is difficult. So many people email me daily and ask me if Ed just ever goes away, and sometimes, they even feel bad that they are in recovery too and still have Ed in their lives–they think it makes them weak. Today, I felt that way too for a moment. I felt like I took the easy way out by throwing away that paper. But the truth is, we are not weak. We are strong. We are strong because we choose to acknowledge Ed and fight him instead of just give into him and pretend that’s the life we want to be living. Strength, however, does not make life easier. My strength that led me to throw that paper away today is not making me cry less. It’s not making the reality less harsh that part of me still wishes to know what that number is. It’s not making it easier knowing that part of me still wants validation from my weight-and maybe that’s human. And maybe the best thing I can do for myself tonight is let myself cry and feel human. I know tomorrow I will be so proud of myself for throwing that paper away. I will be so proud of myself for not searching for that BMI information. But for right now, a part of feels a little broken as I sit here and cry and write this. I still long for that validation that Ed gave me and it kills me and hurts me in the deepest part of my soul that I want that. If there’s one thing I’ve learned along this journey,I always feel better when I extend myself to others. On that note, I would like to give a big shootout to all of our Hello Life fighters all around the world who’ve made insane strides in their own recovery. We had one lifer ask me to send her cookie dough today in France since its a kind we only make in the United States. How amazing is that? I still send out bracelets each week: this week’s will be to Germany. And I still have a vision of expanding Hello Life to help many more people around the world. But tonight, I need to help myself: so I wrote this post–and am sharing my sadness about today’s reality with you all. Once again, today I made the choice to choose recovery. I literally chose recovery over relapse, because that’s exactly what would have happened if I saw that number today–without question. I could have looked at that paper and given it all up and started all over. I am not even sure how, but I didn’t. And that’s what makes me a fighter. I fight even if I feel my gloves are on the wrong hands and my back is turned to my opponent ready to give up-I somehow fight. Today I fought once again for my recovery, even if it means a night of tears and curiosity and sadness. Here’s my plan: I am going to cry tonight out. Maybe I will tomorrow night too. And then on Saturday, I will celebrate my 24th birthday. It will be my second birthday without a scale to ruin it. And I know by then, when I am sitting with my birthday cake and new friends in Washington, I will be so grateful that paper from today is torn up and thrown away. But for now, I know I am not the only one today who made a hard choice to keep my recovery. I know I am not the only one today who has cried. And because of that, I know I am not alone. For the many of us who will be crying together tonight around the world, for the many of us who are fighting for our recovery and for the many of us who aren’t’ ready to fight yet, but are even reading this blog because we know deep down we deserve to one day love ourselves fully, hello life.